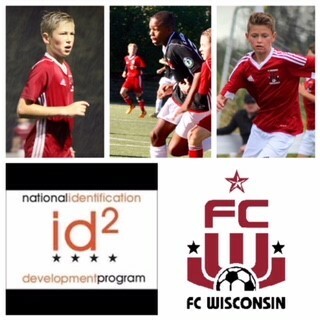 For just the second time in club history, FC Wisconsin has 3 players selected and invited into the Elite id2 camp. Owen Marshall, Brentell Handley, and AJ Wild have been selected from the 2005 age group to attend the March 15th – 18th camp in North Carolina. Here they will be scouted by some of the best coaches in the country, including on site US Soccer staff. They will be evaluated in training sessions and competitions through the stay. “It is such an honor to be selected to the elite id2 training camp. I am really excited for the opportunity to compete against the best players from across the U.S. to continue improving as a player and to represent the FC Wisconsin Family.” -- said Owen Marshall. In total FC Wisconsin has now had 9 total players invited into an id2 camp. One of which, Santi Davila, was selected to the id2 National Team which played in competitions in Barcelona. The id2 Program is open to all players regardless of U.S. Soccer affiliation or lack thereof. There is no cost to players to be identified for or participate in the id2 Program. For id2 Training Camps, all lodging, meals and training gear are provided at no cost by US Club Soccer and Nike. “As a club, our main priority is providing players a pathway that helps them reach their potential. These id2 selections are further testament to the continued work that goes on behind the scenes among our staff, players and families who believe in the program. As a club we are extremely proud and we will continue to try and provide players in Wisconsin the opportunities to develop and be seen at highest levels possible.” -- said Co-Director Ben Shepherd.